New take on werewolf genre - not a big fan of werewolves - but gotta say I just really enjoyed. "There's a long uncomfortable silence in which I contemplate might happen next. Maybe like the villain in a movie, this is where she gives me a long spiel about her hard up life before she kills me. Not that I totally believe she is nefarious. Real life isn't made up of heroes and villains. Just ordinary people making choices that they have to live with." "On my first day of kindergarden, I bit a kid. Hard. In my defense he deserved it." "Among wilderness survival tips, punching a wild animal in the face probably isn't on a checklist." Like most authors, I have a day job. In my case, it's freelance writing mostly. That means a lot of my days are pretty different. Sometimes I'll be going from one client meeting to another. Other days are spent sitting/standing in front of my laptop. I get up at around 8 and often skip breakfast unless you count coffee (sorry Mom!). A "typical" day consists of a combination of checking emails, research for whatever project I'm working on, and writing. I might snack on a yogurt or bit of fruit but usually don't break until around 1 for lunch. At that point I either do a half hour of yoga or go for a walk. Then I work straight until around 5. After supper I'll typically work on my novel writing unless I have social plans. A girl's gotta have fun too, right? What was the first story you remember writing? What was the plot? The first story I have a clear picture of writing was actually a play in Grade Three. It was about a panther who escaped from the zoo and went off on a city adventure. I wrote a bunch of plays with the same character and performed them around my elementary school in subsequent years, adding friends as cast mates. Most of the plots I've forgotten but I do remember having a lot of fun. How do you think you will deal with negative reviews? With grace, I hope. Seriously though, I have no expectation that everyone who picks up the book will love it. Writing is just way too subjective and one person's MUST READ book of the year is another's MOST OVERHYPED book of the year. That said, do I think I'm a perfect writer? No. But I make a living off of words so I'm always open to constructive criticism. 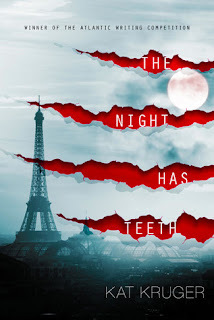 In fact, The Night Has Teeth wouldn't be what it is without my beta readers. I have pages of acknowledgements to attest to that fact. The mean personal stuff that you see in threads sometimes though ... what can you do about it except back out of the room quietly and try to avoid eye contact? If you could be a character in your book, who would it be? and why? That's a tough one! I wrote each of my characters with their own little quirks and flaws but they're all dear to me at the same time. If I had to pick one though it would probably be Roul (a.k.a. Rodolfus de Aquila). He's a fairly minor character but fills a big role. What I love about him most is that he's seen so much in his lifetime. That's not written specifically into this book but I tried to leave hints of it in his name, his scars, the stories he tells. He also has a very cool confidence about him without being arrogant. I'd like to have that myself. What genetic modification do you think it would be awesome to have? Now that's a very cool question and one that I probably should have been a lot more prepared to answer! Um ... I've always found it pretty amazing to see in the animal world how other creatures kind of have a sixth sense about things. Like a dog or cat cuddling with you when you're particularly emotional, or cows lying down because they know a storm is coming. Stuff like that. So, if I was going to be genetically modified I think it would be awesome to have that extra sense that doesn't really seem to be built into humans. I think I would like to be a shifter... I would love to be able to fly or run through the woods like crazy. That would be fun, good luck! ROFL - excellent - good luck in the contest!